6 Tips On How To Make Your Child's First Smash Cake! 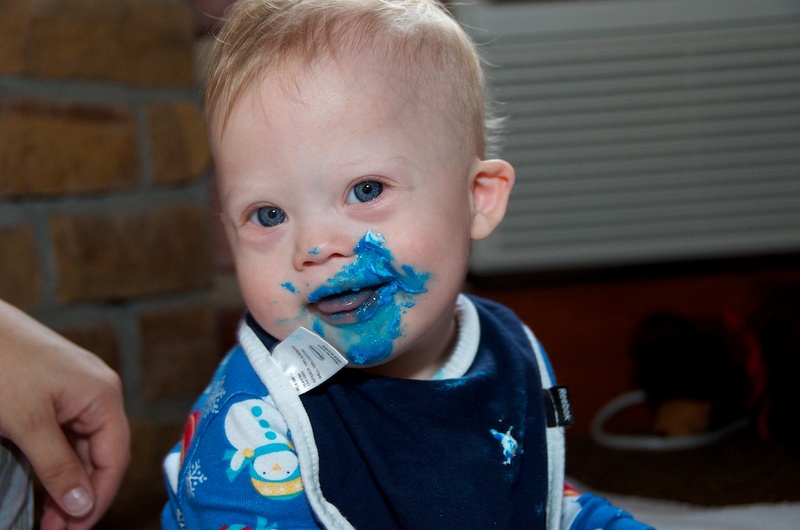 You are here: Home / Family / Noah’s First Smash Cake and 6 Tips To Make Your Child’s First Smash Cake A Smash! 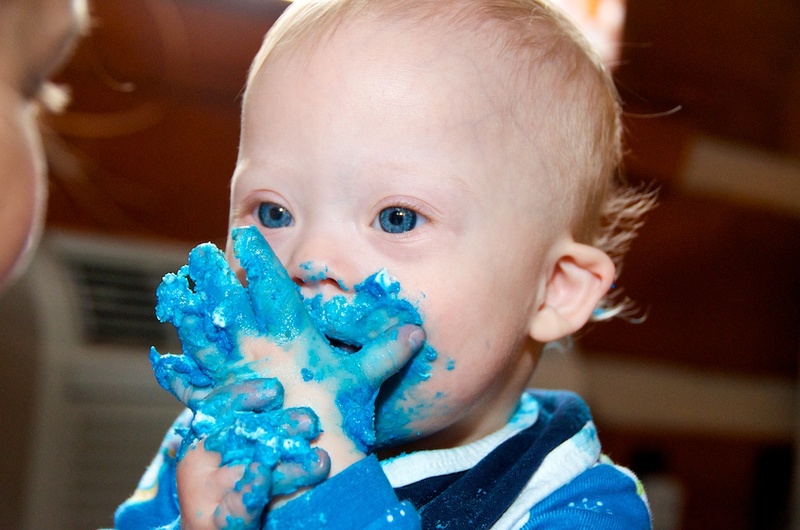 Noah’s First Smash Cake and 6 Tips To Make Your Child’s First Smash Cake A Smash! Our family crams a lot of celebration into the holiday season. From about a week before Thanksgiving to Christmas we have 5 birthdays, oh and 3 of those are just our little family. That’s right, Rick, Noah and myself all have our birthdays at this time. The other two are my niece and nephew. So we are celebrating…a lot, including this weekend. We had a great time with the family! This weekend was around my nephew and Noah’s birthday, so we were having a party which included a very special guest, their great grandma. The party was the day that we were leaving so we had a breakfast surprise for Noah. 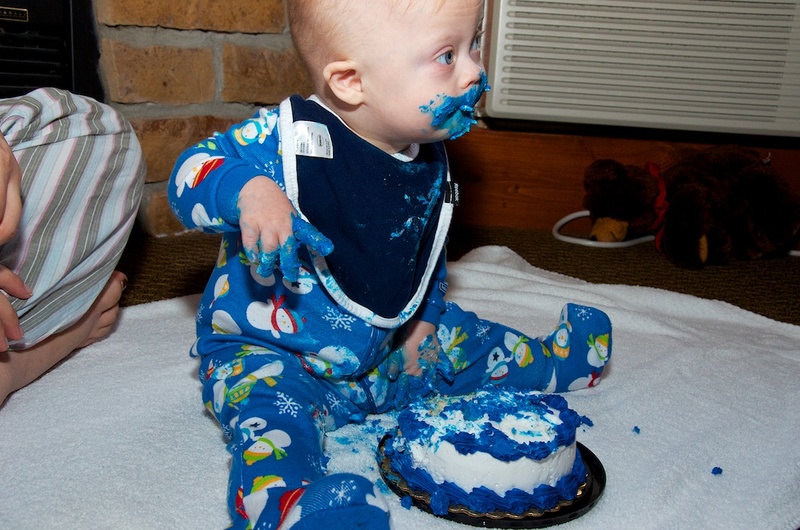 He had his own giant blue cake to smash his fists into. Yelp, that’s right, he’s very own smash cake! The smash cake is something I had never heard of until we started going to first birthday parties, which happens a lot once you have a kid. 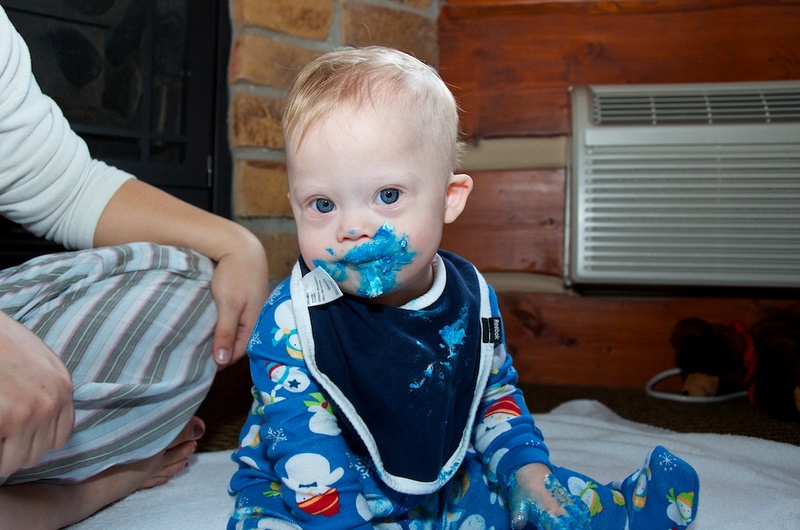 We went to one back in August where we experienced the smash cake for the first time, and I started pondering what Noah would do at his first birthday. Noah’s first smash cake was a smash! The idea is that this is the first time a child is given a cake. They may be tentative with it at first but once they get a taste they dig in with their hands, feet, whole face, who knows. It is intended to be a big old mess with great pictures and lots of laughs. The best part about our first experience with smash cake was that the little girl was not really into the cake, so they put some broccoli in front of her as a motivator and she went to town. So we wondered what Noah would do when we placed him in front of mass of sweetness for the first time? Noah provided us with the ultimate smash cake performance. 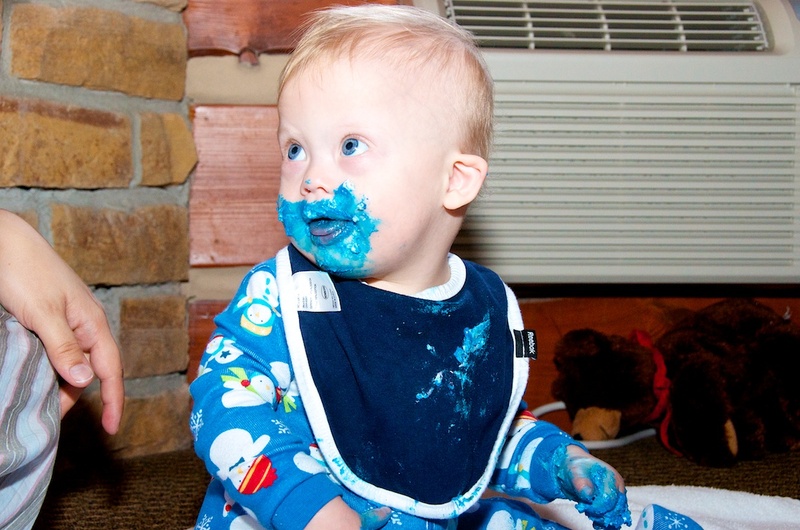 The best part may be the icing choice of blue which coincidently matched his pajamas. 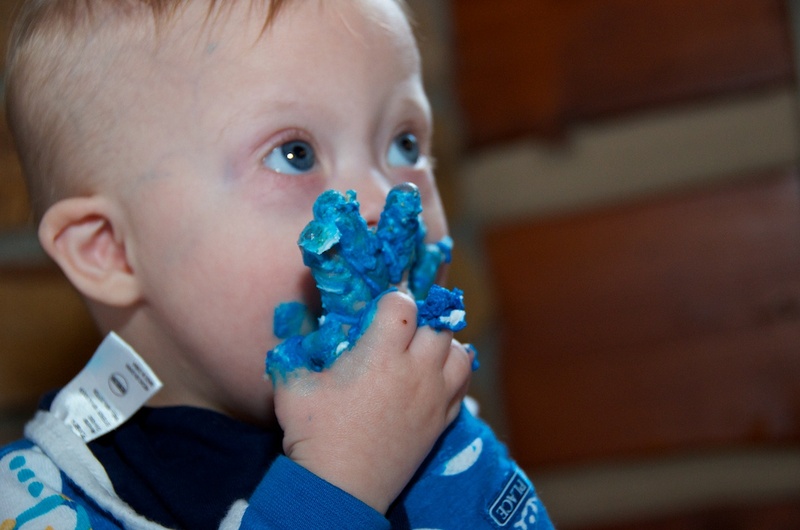 Noah started out just how I envisioned with one hand at first, realization that his hand was full of sweet goodness, followed by digging in with both hands covering his whole face with icing. He ended up looking just like a smurf. 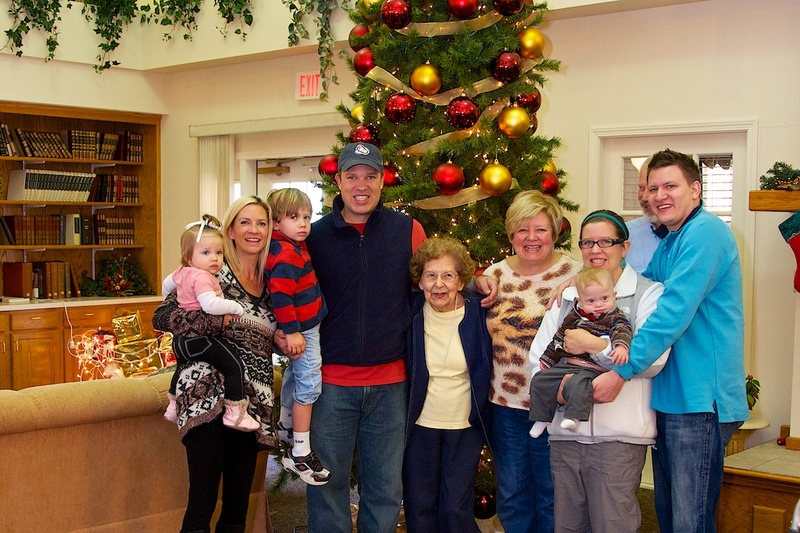 It was a great end to a wonderful weekend with my grandmother meeting all of her great-grandchildren. 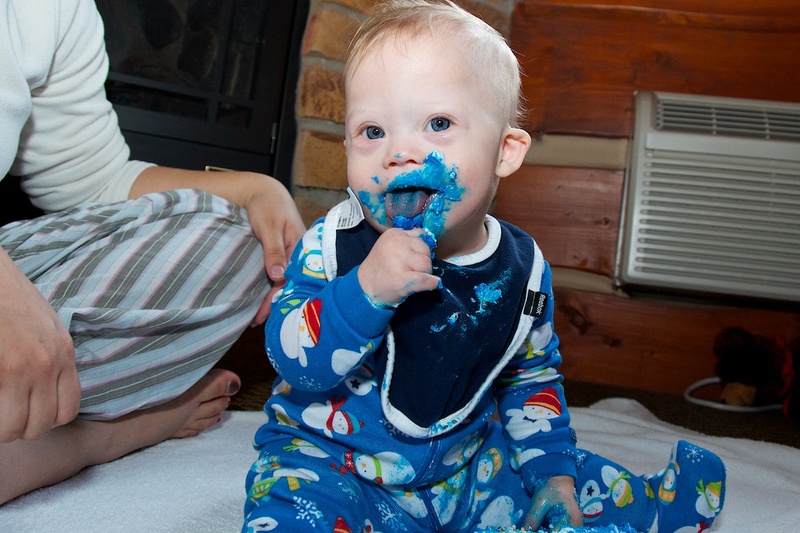 Here’s some pre-bath pictures of Noah enjoying his first smash cake. Now it’s time to clean this little guy up and head to the airport. We’re hoping Noah’s second airplane flight goes as smooth as his first! All cleaned up and ready for the flight home. 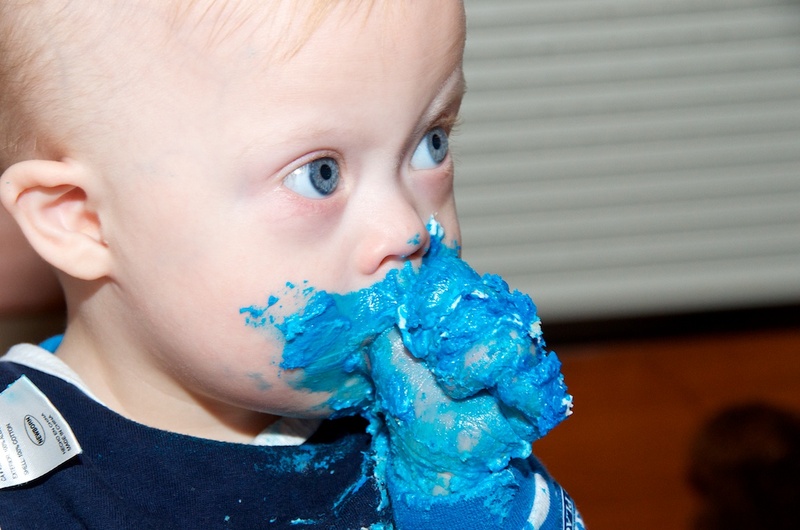 You may not want to use a blue or black frosting. They are really messy and hard to clean up, in fact they may leave a lasting stain on your face letting people know what you have been up to. Bibs only block a small area of space, why bother. Be prepared for it to not go quite like you envision but enjoy every moment of it! 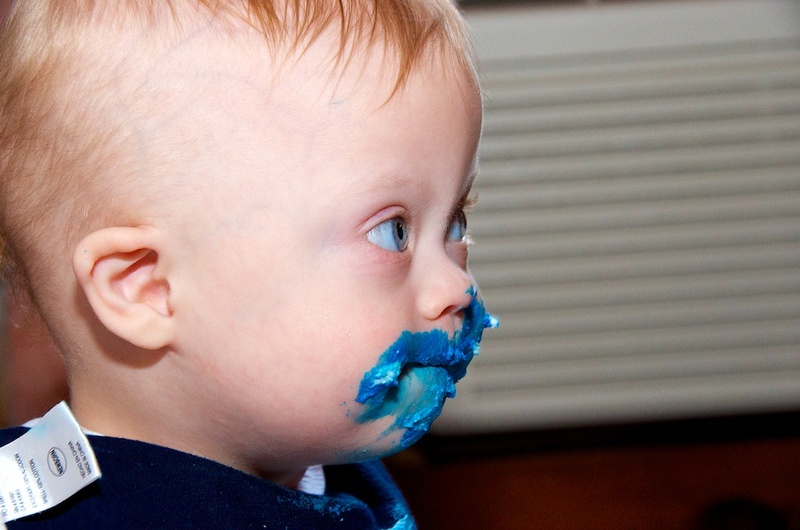 Did you give your child a smash cake at their first birthday party? What do you think about the smash cake tradition? Tell us about it in the comments. Darling! That might be a tradition we’ll have to consider when Elias gets to be one. 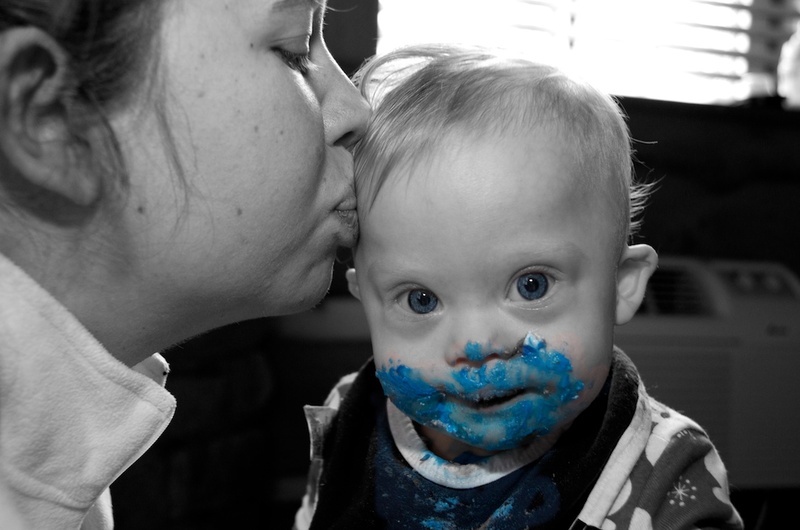 We do have a darling shot of my firstborn eating a cupcake for the first time … two hands smashed against his mouth and cheeks covered in chocolate. I got lucky and a friend of mine had a camera and caught the moment for me, it hangs in my front room wall. Oh my goodness, so cute. 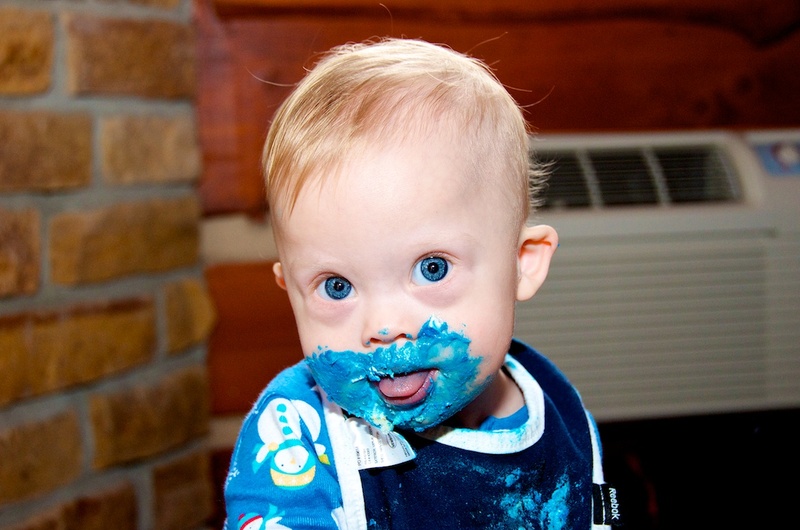 I love how the icing brings out his awesome blue eyes. We did that with our oldest 3 kids and we are excited about doing it for Levi. Something I have to break through is my willingness to let him (and myself) get dirty! 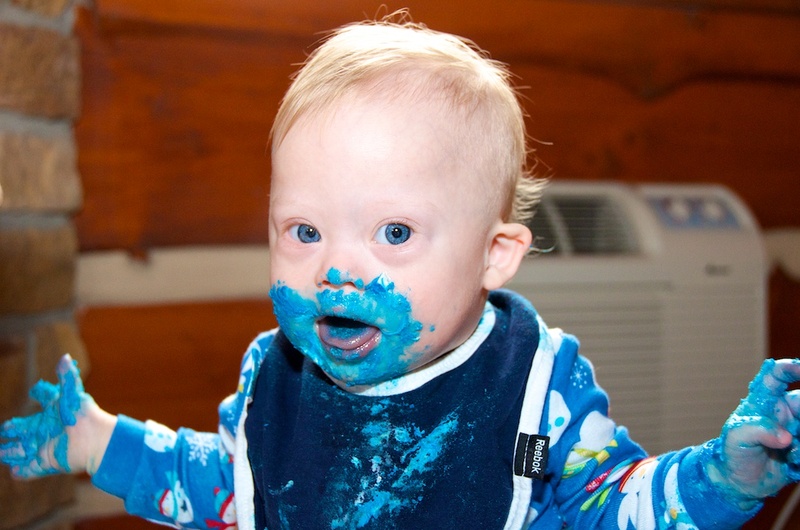 Looks like Noah had a great time, and Abbie, you got a little Smurfy yourself, I bet! AWESOME! I love messy cake pics. Esp when it involves a little kid as cute as Noah. 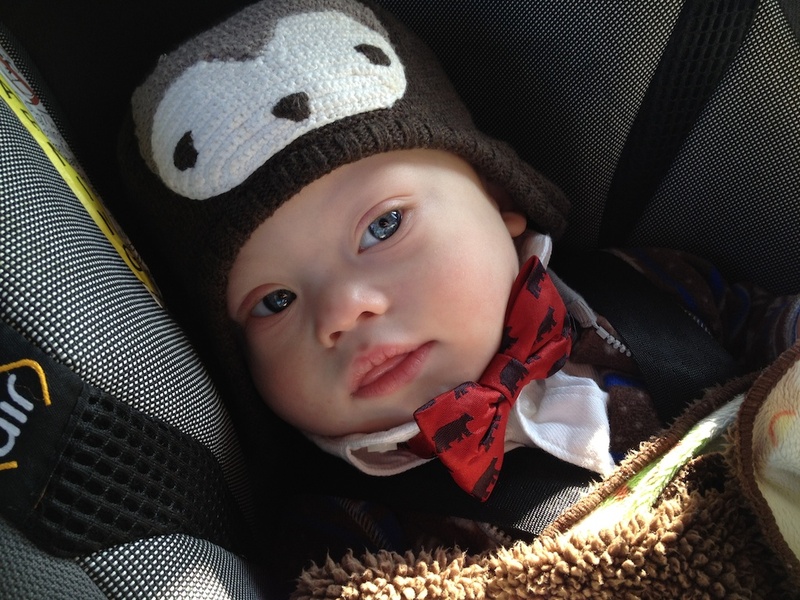 Boy, my middle son gets the compliments on his blue eyes, but Noah takes the prize! I am sure you never get tired of hearing how beautiful his eyes are. Let’s hope he doesn’t get tired of it, cause he’s got a lifetime of hearing it! They didn’t do smash cakes when my kids were little – except by accident – so we now enjoy them with the grandkids. So cute! Levi is 8 months old now. He is growing so fast. It is a joy to watch Noah with him being older. It make me excited about Levi’s future. We live in Arizona. I was reading from a few day’s ago and seen that Noah had a CBC. My Dr hasn’t said anything about doing that text. We had the thyroid, eyes, and ears from the six month check. Is that something I need to request? This site is awesome. I loved it so much I had to re-tweet it. Thanks so much for sharing. We’ve always stripped the baby down to just a diaper when they do the smash cake. Makes clean-up MUCH easier! We had my daughter’s first birthday party at a local play place for kids (think chuck e cheese meets starbucks). We just ripped her shirt completely off. It was warm enough in there and saved the laundry. She didn’t get her hands messy, she just dunked her whole face. I love the smash cake!!! These pics are amazing! He is so handsome! 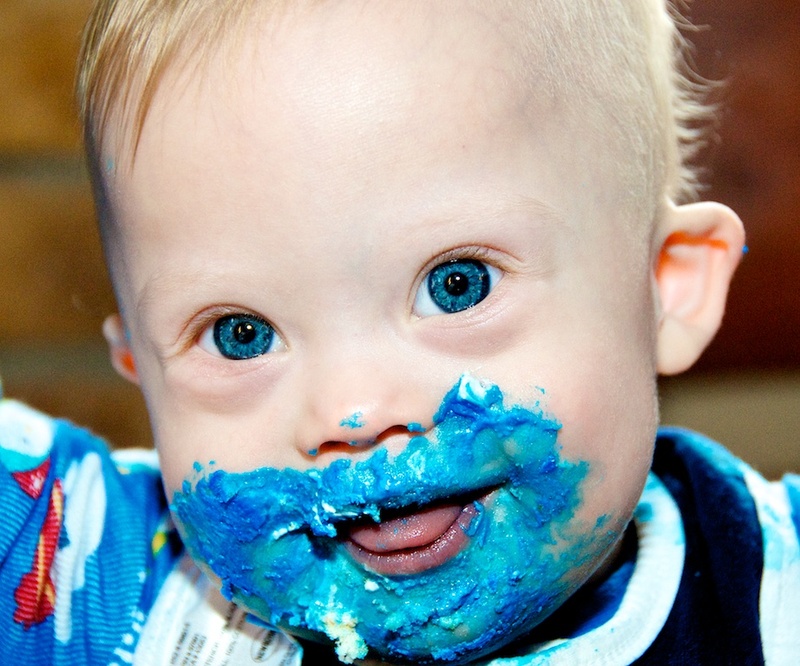 And the cake is the same color blue as his eye! Is that a coincidence?